Wrecking Doll Society, the instructional skate group within Central Vermont Roller Derby, meets weekly in order to teach the rules of roller derby or just give participants a chance to skate with others. If you’re into roller derby and live in central Vermont, you might be familiar with the Twin City Riot, which has battled other roller derby squads from Vermont and New England since 2009. You might have even attended one of their bouts and thought, “Wow, that’s looks like a lot of fun, but I can’t do that.” Well, you can. Twin City Riot is the skating team under Central Vermont Roller Derby. However, Central Vermont Roller Derby also offers an instructional/recreational skate group called the Wrecking Doll Society, which meets at 5 p.m. every Saturday at the Montpelier Rec Center. The group is open to anyone at least 18 years old. Gear is provided for those who want to check out the Wrecking Doll Society. Participants need only to bring their own mouth guard. 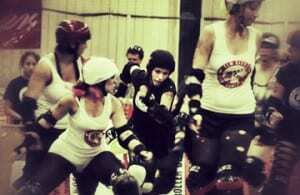 Twin City Riot uses Wrecking Doll as a way to recruit new skaters to the team and teach people about roller derby. The Wrecking Doll Society Facebook page is full of informative videos that teach the rules of the game. Burkholder said Wrecking Doll is a good place just to get some exercise and meet similarly-minded people. Wrecking Doll Society is also open to men. There is a men’s roller derby team based out of Burlington, and there are plans to compete as a co-ed team later this year. Right now, Twin City Riot has about 10 team members. The team is working with four or five people referred to as “fresh meat”, who are being trained to play on the team. While fishnets, tutus, and intimidating names might be the image most people immediately conjure up of roller derby, Burkholder, AKA “Detoxikate” as she is a substance abuse counselor, said showmanship has definitely become less of a focus. “Now it’s really more about skaters doing some incredibly athletic things on the track,” she said. And while roller derby’s focus on showmanship has evolved, the same core principles exist that have been drawing participants for decades. For more information, head to www.centralvtrollerderby.com or check out the Facebook pages for Twin City Riot and Wrecking Doll Society.